True Refrigeration demonstrates its commitment to excellence with its commercial-inspired refrigeration products for the home. At True, we are committed to excellence in the culinary industry through our handcrafted refrigeration products, so we’re thrilled to help recognize those who have excelled in the culinary arts. True Refrigeration®—the leading choice of top chefs, luxury hotels, and discriminating homeowners for more than 70 years—is proud to be the official sponsor of the upcoming James Beard Awards’ Best New Restaurant category and will present the award for the second consecutive year. The event will be held on Monday, May 2 at the Lyric Opera of Chicago, and hosted by American chef and television personality Carla Hall. True Refrigeration will present the Best New Restaurant Award to a restaurant that displays excellence in food, beverage and service and has set the foundation for influence in the culinary community. Previous Best New Restaurant winners include Bâtard in New York City and Pêche Seafood Grill in New Orleans. The James Beard Awards were established in 1990 and recognize professionals in the culinary industry for excellence and achievement in their individual fields. Winners are determined by votes from more than 600 culinary professionals. Along with Best New Restaurant, other award categories include: Outstanding Chef, Rising Star Chef of the Year and Outstanding Baker. True Refrigeration and True Residential are divisions of True Manufacturing Company. For more than 70 years, True® has been an industry leader in commercial refrigeration. Now, homeowners can experience that same quality with True Residential, an authentic commercial refrigeration line refined for the home. 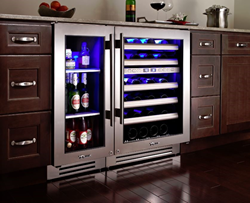 Handcrafted in the USA with the same meticulous attention to quality and detail industry professionals demand, the residential series includes award-winning wine cabinets, refrigerators, beverage centers, refrigerator drawers and beer dispensers. For more information about True, call 888-616-8783 or visit true-residential.com. Founded in 1986, the James Beard Foundation celebrates, nurtures, and honors America's diverse culinary heritage through programs that educate and inspire. A cookbook author and teacher with an encyclopedic knowledge about food, the late James Beard was a champion of American cuisine. He helped educate and mentor generations of professional chefs and food enthusiasts, instilling in them the value of wholesome, healthful, and delicious food. Today JBF continues in the same spirit by administering a number of diverse programs that include educational initiatives, food industry awards, scholarships for culinary students, publications, chef advocacy training, and thought-leader convening. The Foundation also maintains the historic James Beard House in New York City’s Greenwich Village as a “performance space” for visiting chefs. For more information, please visit jamesbeard.org.